Home / Credit Cards / Car Loans or Credit Cards – Which Do You Pay Off First? We can all agree that paying off debt – any debt – is a good thing. But specific tactics for paying off debt are usually open to debate. There are various debt payoff strategies, such as the debt snowball, that simply have you paying off the smallest debt first, then working your way up. But when you have a variety of debts – which most people do – that includes both credit cards and car loans, do you still use the debt snowball? The complication is that not all debts are created equal. Some debts are more threatening than others, while paying other debts can lead to quicker improvement in your financial situation. That’s often the case with car loans and credit cards. So which do you pay off first? On the surface, paying off credit cards first seems to be the default choice, and there plenty of reasons for this. While car loans typically have low single-digit fixed rates, credit card rates can run well into double digits. That would seem to make credit cards the natural first choice. 2. Credit cards are variable rate loans. Car loans are fixed rate, while credit cards are variable. Even if you start with a low single-digit rate – even zero interest – the variable factor means that there is plenty of room for rates to go toward the upside. Credit cards are something of an interest rate ticking time bomb! 3. The revolving nature of credit cards. Another factor with car loans is the term. Even if it runs as long as six years, it’s still certain that the loan will be completely paid off within that timeframe. Credit cards on the other hand are revolving arrangements that can keep you owing money on them for many years, particularly if you only make minimum payments. 4. Credit cards can be annoying! Few other credit arrangements so raise our “debt awareness” as credit cards. There is a term in the lending industry: Once a Visa, always a Visa – and it brings the point home. Credit cards seem to hang around, even as other fixed-term loans are long gone. If you have multiple debts, it will be natural to want to knock out as many credit cards as possible. Despite the usual reasons for wanting to pay off credit cards, there are equally compelling reasons for paying off car loans. 1. A car loan is probably your biggest single debt payment. Next to your house payment, your car loan is probably your largest monthly payment. Paying off the loan and getting rid of the payment may be the single best step you can take to lower your overall debt. The money that you will save as a result of the nonexistent car payment can then be plowed into paying off credit cards, which will make that process go much quicker. 2. Payment-to-balance ratio is usually high with car loans. Relative to the amount of the loan balance, a car payment is typically much higher than credit cards. For example, while you might pay $200 per month on a credit line with a $10,000 balance, the payment on a car loan with a similar balance can easily be $400 per month. Paying off your car loan can be the equivalent of paying off several credit cards – at least as far as the monthly payment is concerned. 3. It frees up a strategic asset. For the vast majority of people, a car is a strategic asset in that it’s completely necessary in order for you to earn a living. This is true whether you commute to a job, or if you have a business that requires the use of your car. Owning the car free and clear eliminates the possibility of losing the car to creditors. And that’s important because the loss of the car could seriously impair your income, and not just your credit standing. 4. It will leave you in a better position to buy your next car. You can never know when your car will break down and need to be replaced. But at least if you own the car free and clear, you’ll be in a better position to make a larger down payment on the next one. That will leave you in an improved future debt position! If your car is 100% financed, or worse, you’re upside down on the equity, you’ll have to scramble for cash to come up with the down payment. Owning the car free and clear will leave you ready for whatever may happen. Each of the advantages – whether they apply to paying off credit cards or your car loan first – will depend upon your own personal circumstances. If the size of your car loan is larger than your combined credit card balances, paying off your car loan may have the greatest positive impact on your overall financial situation. Or, if you put a lot of mileage on your car, and replacement is more likely, paying it off will be a priority. On the other hand, if your credit card balances are large and threatening to get out of control, it may be best to start with paying those first. In a perfect world, we should concentrate on paying off all debts equally. But we’re not equally affected by all the loans that we have. That’s where a priority needs to be developed. What’s your opinion? 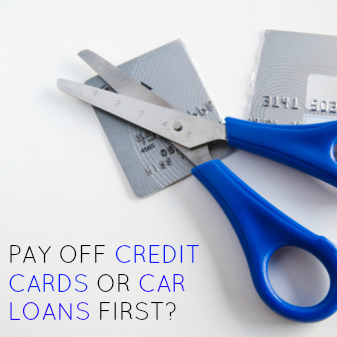 Which loan type would you prioritize for payoff, a car loan or credit cards? Are there any reasons you can think of that I haven’t cited here? Leave a comment! 2 Responses to Car Loans or Credit Cards – Which Do You Pay Off First? If math was the only factor, then yes, paying high interest debt or large payments such as a car payment makes sense. However, if a person did math in the first place, then they would not have a car loan or credit card debt. Behavior is what got them in to debt and behavior is what will lead them out of debt. That is why I recommend the debt snowball. The debt snowball provides quick wins and builds momentum as you move along. It’s like losing weight, you can’t just jump into exercising like an olympian, if you do, your body will stand for it and you will fail and give up. However, if you start out slow and get some quick wins, you will gain confidence and continue to work harder and harder to lose the weight. I agree Robert, but millions of people are in debt, so we’re looking at strategies to get them out. I like the debt snowball myself, but sometimes it’s better to go for the bigger fish. If it looked like I might lose my job in a few months, I’d want my car paid for, even if I couldn’t get rid of the credit cards.